These iris plants came from my father’s collection. I did not get many from him I should have done so. 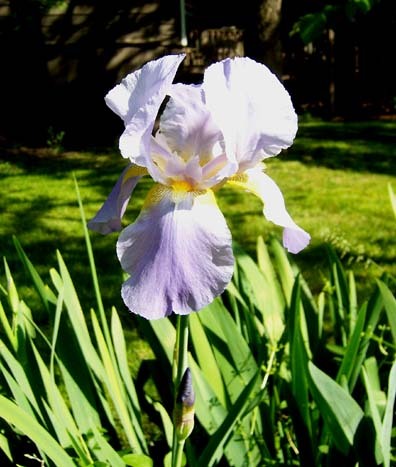 He was a member of the American Iris Society and swapped lots of rhizomes of new varieties with fellow members. This was 50 years ago and these plants are really old. As the years have passed, I have dug and transplanted the rhizomes and trimmed the old diseased areas. I don’t know how long I can keep them. They came from my “home place” ….the property I grew up on…. and, through them, I feel a connection to it. ~ by Sandra Lynn Gray on May 28, 2008. I too have iris from a past generation – in my case, my grandfather. These plants, transplanted in my garden 300 miles away from his old home, remain a strong and wonderful connection. I know. 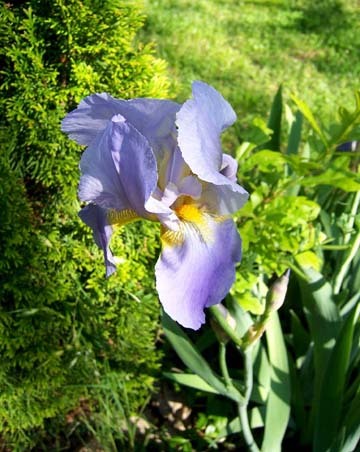 Your amazing post of an iris bloom and your statement that it was your grandfather’s made me decide to post mine. I am not the photographer you are but I am a gardener and have a strong connection to my plants. I so understand your connection to the plants! Even the fragrance can transform us back to a time and place…and most especially to our loved ones. Artist always a good photographer as he/she has better photographic eye than any normal person. I can understand your connection to these plants. Both my parents are gone now (within two short years), and after we prepared the family home for selling, I went back to take a few clippings of the 40-year-old bright red geraniums my dad had planted way back when. I babied them through the winter, sticking them in sand as a plant expert suggested…watering occasionally…keeping them warm. By spring they were hollow stalks and I had to toss them. I realized much later that I really don’t like geraniums that much. It was the connection that cornered me. These Irises are lovely. I hope you’ll keep the healthiest ones.